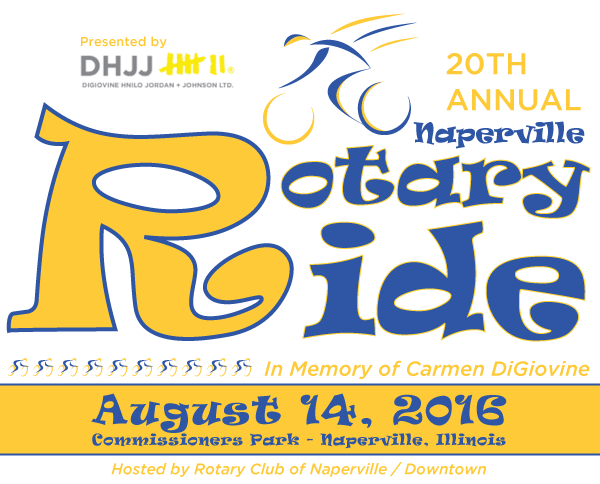 The 20th Annual Rotary Ride, sponsored by the Rotary Club of Naperville Downtown, will be held on Sunday, August 14, 2016. The ride is SAG supported, and offers a 1.4 mile family loop, and 21, 41, and 62 mile (metric century) routes through the far western suburbs of Chicago, stretching from Naperville through Oswego mainly on scenic rural roads. Early registration is $30 until July 1, then $40 to July 31. After July 31 and day of ride registration is $50. Riders guaranteed a tech logo t-shirt if registered by July 21. Proceeds will benefit Rotary’s PolioPlus program, Naperville Responds to Our Veterans, and Naperville CARES. Riders can start anytime between 6:30 am and 10:30 am. Food and beverages provided at start/end and each rest stop.